University of Sydney academic Tim Anderson is under investigation after coming to the defence of a former colleague photographed wearing a controversial patch, the Sydney Morning Herald reported last week. Dr Anderson, senior lecturer in political economy, came out in defence of his former co-worker and current USyd PhD candidate Jay Tharappel. Anderson took to Twitter to address the criticism levelled at Tharappel, tweeting, “[Jay is] a great friend of Syria” who is “under attack from Zionists”. The Yemeni Houthis are an armed political Islamic group fighting against the internationally recognised Yemeni government, whom they have accused of financial corruption, and which has the backing of Saudi Arabia and the United States. Australian media has largely understood Houthi rebel groups as Iranian proxies; others say they are resisting imperial aggression from the West. The UN has described the war in Yemen as the world’s worst humanitarian crisis. Tharappel claimed he has “never publicly attacked Jewish people.” He said that he does not agree with the line cursing Jewish people, which is considered by most to fall clearly within the International Holocaust Remembrance Alliance’s accepted definition of anti-semitism as a ‘rhetorical expression’ of ‘hatred towards Jews’. Tharappel acknowledges the connotations of the phrase, telling Honi that he has since cut the phrase from the patch. The question remains as to why Tharappel did not do it sooner. This is not the first time the pair has been under scrutiny from the University. Tharappel was recently investigated by the University for calling a journalist of Armenian heritage “traitorous scum who desperately wants a second Armenian genocide,” and stopped tutoring at the University roughly six months ago. 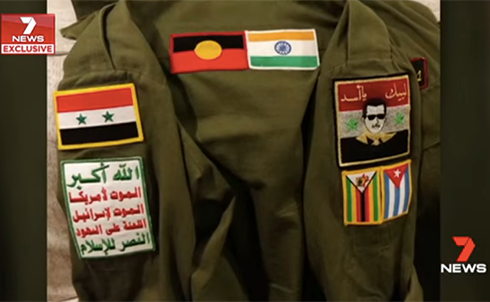 Jamal Daoud, who is part of a Palestinian Muslim group that wrote to the University asking Tharappel to be censured for hate speech, told Honi that he believes the patch is “deeply offensive” and “cannot be worn for any reason”. Daoud has asked Tharappel for a public apology for his actions, and has also led calls for the University to investigate Anderson. Anderson and Daoud have been engaged in an ideological disagreement since 2013. While it would appear the two are cut from the same ideological cloth—both are supporters of the Assad regime and the right to Palestinian self-determination—their differences lie in how they perceive each other’s integrity to the cause. In 2017, Anderson accused Daoud of bringing an Israeli propagandist to Syria. He also condemned Daoud’s Facebook campaign to ‘unmask’ fake experts on Syria. Daoud confirmed that he has called Anderson a ‘Zionist’ because of Anderson’s alleged involvement with Ananda Marga, an Indian socio-spiritual organisation which he alleges has Zionist connections to Israel. He has also launched multiple complaints with the University about Anderson’s conduct over the years. Daoud alleged Anderson had endorsed death threats towards him and other members of the ‘pro-Palestine community’ in late 2017, an allegation that Anderson denies. The University’s investigation into Anderson is ongoing.